The garage door has been rattling off and on for the last few weeks. Now, on a cold winter morning with ice and snow everywhere, the garage door refuses to open. It’s time to call the office, get alternative transportation for the kids and someone to help get the door moving again for the next day. To get out of a pinch like this one, there are garage door services to help. Even better, with a few minutes of inspection and some care tips, we can all elude a troublesome morning because of a malfunctioning garage door. If we think about it, the garage door opens and closes almost daily and mostly, twice daily. Worn out parts is a natural part of the life of a garage door. Listening and paying attention for squeaking, rumbling and other sounds from the garage door is a way to remain alert to potential issues. Following up with a visual inspection of the moving parts while the door is opening and closing allows us to find and replace worn parts before they prevent the garage door from opening or closing. The moving parts to inspect are the rollers, hinges, bearings and latches. Replacing these worn out parts will keep the garage door operational and running smoothly all year around. By getting parts replaced along with regular checkups of the garage door, any problems will be prevented without disrepair. If the garage door sounds persist, it may be the garage door tracks. The place to start is checking for impediments in the door tracks such as leaves, gravel, dirt and salt. Impediments can cause premature wear and tear to parts such as rollers and other parts. If the tracks are clear and the sound is a rubbing sound, it could be the door tracks are not aligned. This may be due to something as simple as a loose screw. If that’s not the case, then err on the side of caution by calling in overhead door professionals to assure the tracks get aligned properly. 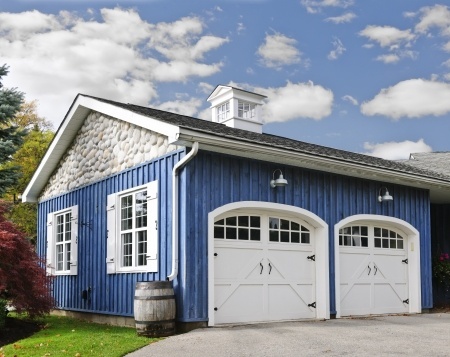 A garage door which is properly balanced and with garage door tracks aligned will reduce wear and tear on the parts to ensure long lasting and problem free garage door ownership. When it comes to a balanced garage door and properly align garage door tracks, leave it to the trained professionals for peace of mind. Many of the garage door parts are metal. Lubricants such as silicone based ones or grease help prevent friction between parts as well as expansion of metal which causes ill-fitting parts to rub together unnecessarily. Lubricants protect metals from freezing or freezing to other parts. With lubricants, metal parts continue to glide smoothly over each other even when frigid temperatures settle in. Assure lubricants are clean and the correct viscosity for the cold of winter and then again for the heat of summer. Check with your local garage door expert for advice on lubricants which work best for the seasons experienced in your region. 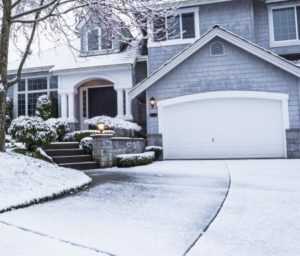 The weather-stripping that runs along the bottom edge of the garage door serves to prevent cold air from rushing into the garage. If there are broken edges to the weather-stripping, the garage and house may be losing heat. This makes it more difficult to maintain a warm garage and home. Weather stripping should be soft and pliable to effectively seal against water and cold. Brittle weather-stripping is more likely to lift and collect ice at the base of the door. Weather-stripping in good condition will also keep out insects and small rodents. Care for the weather-stripping of your garage door and it will protect your family and home. If you’re handy, there are many YouTube videos and help by the local hardware store to show you how to replace the weather-stripping. Otherwise, request a weather-stripping replacement from a local handyman or garage door specialist. A utomatic garage doors come with a safety feature so loved ones will be protected from the closing mechanism should they be in the path of the garage door while the door is on its way down. The way to test if the safety features are still working properly is to place a piece of wood or a brick on the ground in the path of the garage door. Then, push the button to close the garage door. When the garage door presses against the wood or brick, it should release and return back to an open position. If your garage door is not doing this then there is something amiss. If your garage door has photoelectric sensors, it might be the photo eye that is a problem. To test the photo eye, wave the handle of a broom or shovel in front the photo eye sensor while the garage door is closing. The door should reverse when the sensor beam is broken and return to an open door position. If this is not happening, start by wiping the front of the sensor to clean the path for the beam to appear. If the path of the beam is clear, the next step is to make sure the sensor is pointed towards the sensor on the opposite side of the garage door opening. If not, the sensor may have been knocked out of place so a small adjustment may re-align it and make it activate again. If any of these safety features continue to malfunction, it’s time to have your trained garage door professional troubleshoot the safety mechanisms so your family will remain unharmed. Overall, a semi-annual check of your door for wood chips, rust and fraying tension cables will help maintain your garage door for many years of use. While the handyman in the family can sand wood and rust from garage door parts, seek a professional if you find any fraying tension cables. Garage doors can be very heavy so a well-maintained door is important to its daily function and to your family’s well-being. An ignored garage door can lead to a wide range nuisances, damage to vehicles and most importantly, endanger the safety of family members. If you believe there may be an issue, call your local professional today and make a semi-annual garage door inspection part of a garage maintenance routine.